First Lady Michelle Obama might keep her husband on a healthy diet when he’s in the White House, but it looks like President Obama doesn’t stick to the same rules on the road. 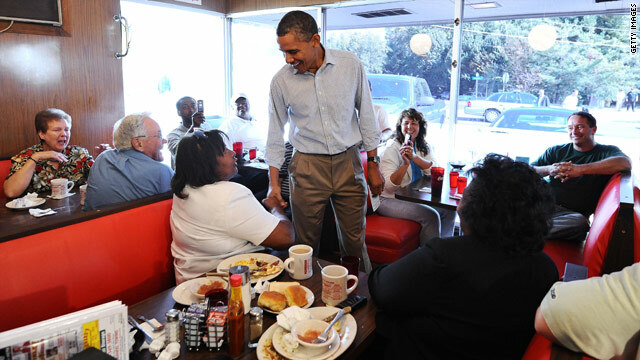 Speaking in Jamestown, North Carolina Tuesday, the president remarked how much he enjoyed a good helping of North Carolina barbecue the day before as well as some “hush puppies” – a deep-fried favorite in the South. Of course, these are some of the same fatty foods Michelle Obama advocates against consuming on a regular basis. “We stopped for a little North Carolina barbecue and sweet tea along the way. Some hushpuppies. Don’t tell Michelle exactly what was on the menu,” Obama told the laughing crowd. Looks like the president didn’t eat much better today. According to the pool report, his lunch consisted of a cheeseburger, fries and more sweet tea during a stop at Reid's House Restaurant. But in the president’s defense, he did spend more than an hour at the gym this morning working off some of those calories. « Previous entryCan you hear me now? Well, he has to blame being stupid on something, who cares if he eats at all on the road? Does he go to the bathroom regular? I guess we want to know that to. He's a joke anyway. ... he's such a regular alinsky dude, a hush puppy op for mr "treat me like a dog" & woofing fries michelle,?.., another steamie poopin job act, whatah bout the sweet tater pie better than th coconut cream? whatevuh, was it hugh k lelee or u.k. l. lee on his dog huntin papers? Really? Learn how to write before you go ragging on the President of the USA! Let the poor guy have a burger, or some Q, who are we to tell him what to eat? pResident Obama's motto........."do as I say not as I do'. CNN trying to make Obama seem good, move along.